There is one fact, however, that keeps creeping in, and that is: that the probability of these two maulings occurring on the same night was infinitesimal. “A trillion to one,” some said, but that is not a figure I’m comfortable with. I think the odds were less — considerably less, and I think it important to understand the conditions and never forget, least we again create a problem situation. 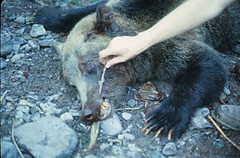 Here is my rationale, and it is based in part on a considerable amount of research I conducted for a major story I wrote for Smithsonian magazine about bears and bear maulings. I wrote the story in the mid 1980s after another horrible twin mauling occurred on Divide Creek, also in Glacier. In this case a young couple (Ammerman and Eberly) were camped (OK, so they were illegally camped, considering the outcome who cares ?) adjacent to the creek which was unknowingly in the path that a grizzly bear followed almost every night on its way to a garbage dump, one located just outside of the park. 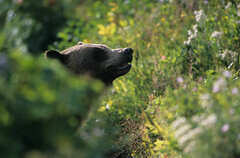 My research emphasized that there was little that would stop a bear intent on feeding on garbage. Highly charged electric fences didn’t work, and sadly the obstacle of two campers didn’t work either. The result was another twin tragedy. Click to see larger image. 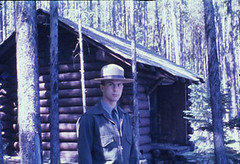 L to R: Kintla Lake was my first ranger station; examining rogue grizzly bear and discovering glass embedded in its teeth; Bert Gildart with rogue bear shot at Trout Lake. 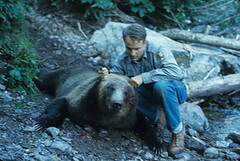 Though the term habituation was not familiar in 1967, bears at both Granite Park Chalet and Trout Lake were certainly habituated. They craved garbage and absolutely nothing would stand in their way. Certainly this is all in retrospect and is not to imply managers at the time would have knowingly tolerated a situation that might have lethal consequences. I say that even though both David Shea and I had reported our findings to authorities at headquarters. As the “Night of the Grizzlies” retrospective brought out, one week prior to the maulings, Shea and I had hiked to Granite Park Chalet and had witnessed a horrible spectacle in which chalet personnel were dumping garbage over the balcony to lure grizzly bears in for free food. Our report was ignored but that may have been because Glacier was experiencing one of the worst fire seasons ever, and so headquarters was mostly without a nearby permanent staff, which is where authority ultimately rested. Garbage was also present at Trout Lake and in such immense quantities that another monster situation had been created. I once found cans of honey, pancake mix, cans of tuna, rotten sandwiches — enough discarded garbage to fill 17 burlap sacks later flown out in a helicopter, and that was just for starters! In other words, here were two completely separate situations and each could have but one outcome, and that was a mauling. If my basic assumption is ball-park correct, then statisticians should view things differently. Rather than “a trillion to one,” the odds change and are based more on the number of days during which a probable mauling might occur. Most of Glacier’s other maulings (some with black bears lured into cars for better photo ops), however, have occurred between July and September, and isn’t it acceptable then to focus on this three-month period, a time frame of about 90 days? Again, I want to emphasize that I believe the 1967 maulings were a given, that under the circumstances they were absolutely inevitable! If that’s the case, the probability of a mauling occurring on August 12 at Trout Lake was 1 out of 90. 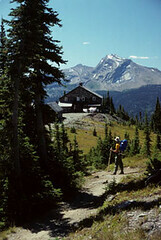 The same is true as well at Granite Park Chalet; there could be no other outcome! 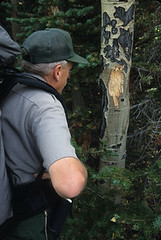 Click to See Larger Image: Ranger Bill Hutchison examining area for grizzly bear sign and finding it in the form of tree markings; sometimes bears turn rogue, generally subsequent to being feed; Heaven’s Peak separates Granite Park Chalet and Trout Lake, the two of which are 8 linear miles apart. Now let’s take a rule from statistics, one which says that the odds of two separate events occurring at the same time is the product of their individual probabilities, meaning that the likelihood of these two mauling occurring on the same night (say, August 12) is one in 8,100. From a personal perspective I am delighted for the small part I was able to contribute to the program and pleased many of my images (perhaps 25) were used by director Gus Chambers. To help set the background for my thoughts I’ve included a few of those pictures (above) in this posting. My thoughts also suggest that though conditions were ripe for these two maulings, such is no longer the case. NOTE: As a guest speaker, I’ll be showing the above photographs (and many others, too) between June 2 and June 4 at an International Airstream Rally in Jackson, Ohio. My program will also highlight Glacier, now celebrating its centennial. Unfortunately, I’ll be flying and not traveling in our RV, which I regret. This entry was posted on Thursday, May 20th, 2010 at 6:42 am and is filed under Glacier National Park, View Point. You can follow any responses to this entry through the RSS 2.0 feed. You can leave a response, or trackback from your own site. I watched the PBS special the other night. Very interesting. I’ve never seen a grizzly. Black bears? Yes. And I’ve always used caution with them.